About Alaska Software: founded in 1997 with offices in Grand Junction, CO, New York City, NY, and in the metropolitan area of Frankfurt/Main, Germany concentrating solely upon the development and improvement of Xbase++ as a technology platform. Xbase++ is a 100% Clipper compatible xbase language, enriched and improved by features like object-orientation and data persistence. Alaska Software pioneered the implementation of intelligent and easy-to-use multi-threading technology in Xbase++, especially for Line-of-Business and mission critical applications. Crucial to the corporate philosophy is the effort for continuous innovation and technological headway while aiming to provide the best possible continuity and protection of previous investments of time and effort. More than a Million application end users and thousands of former Clipper, dBase and FoxPro developers rely upon Xbase++, having built their business success upon the language. The company is 100% privately held and therefore purely technology driven. This is fortified by the fact that more then 50% of all expenditures are devoted to R&D. The company is profitable and allocates approximately 15% of its revenue into free reserves. R&D activities for the Xbase++ technology platform have been awarded financial support from the German Federal Ministry for Research and Technology, the German Developmentbank: KFW, and the tbg; the total amount of investment received: 5 Million EURO. About Xbase++: The following innovative features and their commands have been integrated into the existent xbase language: object-orientation including object-versioning and object-persistence, a native code compiler for improved performance, dynamically loadable Database Engines, and intelligent and automatic multithreading. Anyone who develops in an xbase language is able to use Xbase++ from the start and then step by step become familiar with the newest features and concepts in order to integrate them into existing projects. With Xbase++ one can develop single-user, multiple-user, client/server as well as server applications. Xbase++ supports the following categories of applications: Stdin/Stdout, CGI, services, Windows Console (text mode), Windows GUI as well as hybrid applications (i.e. text mode and GUI blended). Changing to Xbase++ brings with it the immediate advantage of the removal of imposed limitations: arrays may be comprised of millions of dimensions and billions of elements; a string can grow as big as 750MB; Blobs can have up to a couple of Gigabytes; an FPT file could be as big as several terabytes; the number of open tables and indices is unlimited. Processing time is in most cases considerably faster than working with an interpreter, such as dBase/FoxPro or a compiler in Clipper. Changing to Xbase++ also helps avoid costly redevelopment from scratch. Enhancements of existing solutions can be implemented with the utilization of modern technologies and concepts. Gradual modernization of existing applications or the development of new applications according to the most modern standards is feasible, based upon the knowledge and experience with Xbase++. To sum up, changing to Xbase++ means maintaining your productivity, as going to a non-xbase-language always implies much higher costs and learning curves. Our Vision: is based upon the groundwork of the modern Xbase++ language: to foster and establish - to the utmost extent possible with the continuation of backward-compatibility - a development platform which re-engineers software development, changing it to what it was meant to be originally: The solution of real-world problems put down into 1s and Os. Unfortunately, in today's world ever more efforts and financial resources are put into writing of infrastructure-specific code! Alaska Software is absolutely convinced that the blending of application logic and infrastructure-specific code has contributed tremendously to the current software crisis. In order to counterbalance and/or abolish this tendency, we see it as our obligation to undertake even more R&D. Please take time to look at our project "Arctica", whose goal is to eliminate the differentiation between relational and navigation oriented DBMS as well as between local and client/server DBMS so that consistent and uniform implementation of business logic will be facilitated. Most importantly, this will be possible regardless of whether the business logic is run on the Client and/or on the Server-side. 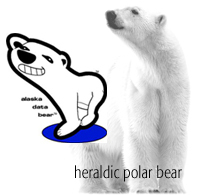 The trademark of Alaska Software is the "heraldic polar-bear", as shown on the right hand side. There is also a comic-figure version of it, called "the alaska-data-bear". Both polar bears, irrespective of whether we look at the strong one or the cute one, symbolize inherent strength, presence, self-confidence, determination and robustness of the company in order to meet the challenges of the market and to ensure investment protection by unifying backward-compatibility with the latest technology developments.